On Cinco de Mayo, I went out for Mexican for lunch - my favorite kind of lunch! I wanted to cook something Mexican for dinner, but since I had just enjoyed enchiladas, rice, beans, and nachos at lunch, I decided to go with Mexican inspired, instead. Jon marinated pork chops in a tequila/chili marinade that he whipped up and then grilled them. I found potato inspiration in this recipe for Jalapeno Mashed Potatoes. I love roasting peppers and the smoky flavor they bring to dishes. Jalapenos are spicy, but roasting them brings out a deeper heat, not the on the surface, tongue burning heat you get from raw jalapenos. To roast them, I simply placed them on the grates on my gas stove top. I flipped them around a few times until all sides were black and charred. Then I covered them for 10 minutes before gently removing the skins. Wash potatoes, halve them, and put in a pot of lightly salted water. Bring to a boil and cook until tender, about 12 minutes. Drain. In the meantime, transfer the jalapeno/cream/salt mixture to a blender and puree. I used my handheld immersion blender with one of the cup attachments since it was such a small amount. Add jalapeno puree, butter, salt, and cream to potatoes. Whip until creamy using a handheld mixer; adjust salt as needed, add more cream and butter if you want to get them lighter/creamier. Note, I normally use my hand masher, but wanted light whipped potatoes for this dish. Mix in the sour cream and transfer to a baking dish. Top with the shredded cheese and bake for 15 minutes, or until the cheese has completely melted into the potatoes. I wish you could taste these potatoes through your computer screen! The jalapeno added the best flavor - not overpowering, but deep and smoky with just a touch of heat. We both had seconds, and I have to admit that I finished the potatoes over the next 2 days... leftovers were great! Those look like some delicious mashed potatoes! I love the Mexican kick! oh yum! these look fabulous! one of my favorite mexican restaurants has potatoes like these. the roasted jalapeno is fab! looks really good! MMM! Any way I can add mashed potatoes to a meal is fine with me!! 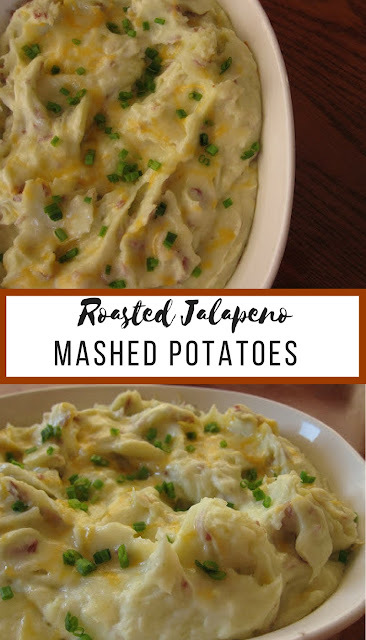 I made this last night to go along with an oven stuffer that I seasoned with Cumin, Ground Clove, Garlic, Lime Juice and Ground Coriander...OMG, these were THE BEST mashed potoatoes I have ever tasted. Instead of using chives, I chopped up some green onion and let the cheese melt on top of them. I also didn't use the sour cream because I wanted them a little thicker. I think I might be your new biggest fan!!! I made these last night, and I agree with the previous poster, they are the best mashed potatoes that I have ever had. I'm so glad we have leftovers so that I can eat them all week. Thanks for such a great recipe!